When the New York Rangers decided to buy out the remaining three years of his contract last June, Daniel Girardi called on the same dogged determination he has exhibited throughout his career. He could have fretted over the fact that he was 33. He could have listened to the chatter that he was slowing down and no longer worthy of the minutes for a top-four defenceman. He could have called it a career. Instead, Girardi listened to the inner voice that has helped him overcome hurdles earlier in his career. A couple of teams had interest. 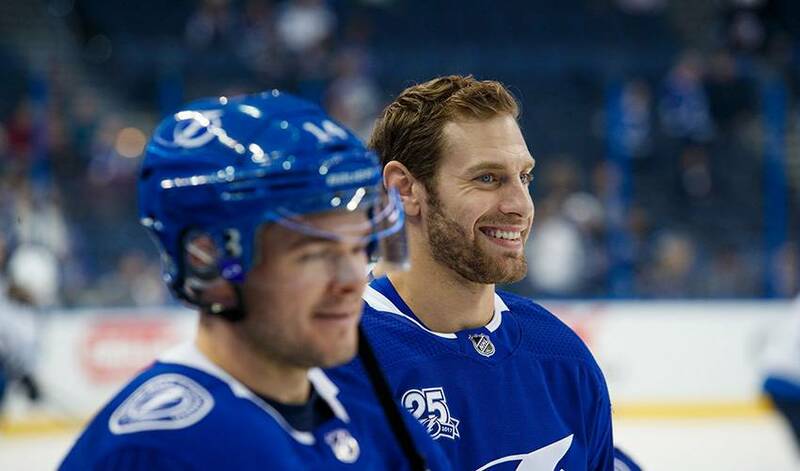 He decided to join former teammates Ryan Callahan and Anton Stralman in Tampa Bay with the Lightning, a club that missed the playoffs a year ago. With a healthy Steven Stamkos and Girardi on the Lightning’s second defence pairing alongside his old Rangers partner, Ryan McDonagh, acquired from New York at the trade deadline, Tampa Bay is tops in the Eastern Conference and preparing for a long playoff run. Being himself is a mantra that has served him well. Still, nothing has come easy for the defensive defenceman and shot-blocker extraordinaire. Even though he helped the Guelph Storm win the 2003-04 Ontario Hockey League title and the London Knights to the Memorial Cup championship the following year, a pro career was uncertain for Girardi. He had gone undrafted. But Girardi’s work ethic and hockey smarts kept catching the eye of Rangers Ontario-based scout Rich Brown. Brown had an edge on his competition. He had insider knowledge because he was buddies with London general manager Mark Hunter. Brown was Hunter’s assistant when the latter was the head coach of the 1996-97 AHL St. John’s Maple Leafs. A few seasons later, Brown was the head coach of the OHL Sarnia Sting and Hunter was the GM. Hunter gave a glowing report on Girardi. Hunter told Brown about the right-hand injury Girardi suffered in the first round of the 2005 playoffs. The Knights wanted the defenceman to get an x-ray on his hand, but Girardi claimed that wasn't necessary and instead opted to play through the pain. After the Memorial Cup win against Sidney Crosby and the Rimouski Oceanic, it turned out Girardi played with a broken bone in his hand. His character earned Girardi a two-way AHL contract with the Rangers affiliate in Hartford. But he began his pro career in the East Coast Hockey League with the 2005-06 Charlotte Checkers. Girardi, however, was promoted after just seven games with Charlotte to the AHL after Rangers farmhand Joe Rullier was hurt in Hartford. The following season, another opening occurred. Rangers defenceman Darius Kasparaitis was injured. Girardi replaced him and has never looked back. He went from undrafted to the 2012 all-star game to a Norris Trophy candidate that season to the 2014 Stanley Cup final with the Rangers. Now he has made the most of his opportunity with the Lightning. But first, he has a bit of unfinished business to attend to. He and McDonagh will return to play their first game with Tampa Bay against the Rangers in Madison Square Garden this Friday. This is a triumphant return, but Girardi has never been the gloating type.